As most everyone else does between Christmas and New Year’s Day, I’ve been thinking much about what I want to see in 2014. As the snow falls and the temps waver from low to high single digits, it’s only natural to think about spring … and baseball … and what I want to see from the Cardinals as the weather warms (both the temperature and my spirits!). Taking a look back at last year’s New Year Wish List makes me wonder how much will change between now and October, but it’s fun to look ahead and wish, nonetheless. So, as I watch the end of the college football season and look ahead to 365 days of new opportunities, here are 14 things I’m hoping to see from the 2014 Cardinals. We’ve been hearing about BPV for so long. This winter, watching the progress as it becomes a reality, has me yearning for the first opportunity to see it in person. (Like I need another excuse to visit the happiest place on earth!) The legacy that is St. Louis Cardinals baseball deserves a showplace worthy of its history, and here’s hoping the city does it up just right! I know “front office guys” don’t usually show up in game recaps or headlines. But, I hope to hear what Carp is up to throughout the year. I mean, don’t you? It seems like ages since I saw Oscar play with the Quad Cities River Bandits as a highly-touted draft pick who “just needed time to mature.” Many thought we’d get our first glimpse of the stud last season, until a pesky injury derailed his year. The way his 2013 campaign ended leaves many question marks about this year: will his ankle be 100%? Did the time missed hault his progress? Does he have a shot at the Big League roster out of Spring Training (especially in light of Carlos Beltran’s leaving)? Only time will tell. Speaking of unanswered questions, what do you do when you have five starting spots and seven (or eight?) potential starters? Adam Wainwright’s a lock. Michael Wacha is, too. (More on him in a moment…) I’d venture to say Jaime Garcia slips in without question. But, what about Shelby Miller who spent the postseason playing the roll of the invisible man? Did Lance Lynn cement his spot with another (mostly) strong season? Where does everybody’s favorite “fill-in stopper” Joe Kelly fit in? It’s hard to deny his value to the 2013 campaign. Then there’s Carlos Martinez, who we’re told is preparing as a starter, and other who could be doing the same? As usual, though, “too many starters” isn’t a bad problem to have (see 2013 for proof). Because, who doesn’t love dancing Joe Kelly .gifs? No one I know. For the second year in a row, I’m wishing for a healthy Allen Craig. Much of last season, he was the go-to RBI guy. In an offense that struggled to score runs late in the season, he was sorely missed. I don’t care what the “experts” say. Yadier Molina is the most valuable player in the game today. With a pitching staff heading into its second year as a unit (of one form or another), he shouldn’t have to micromanage quite as much on the field. But he can. And he can hit, too. He’s the field chief, and he’s the heart and soul of the current Cardinals. Somehow, he always finds a way to improve himself, and in doing so, improve his team. Here’s hoping for another healthy season for our MVP. The guy who “filled in” at second base last year turned into an MVP candidate himself. What he did shocked baseball. Without high expectations on his shoulders, he turned himself into a star. Will his second season as an every day player have the same pop? I like small-ball as much as anyone. I really do. Double steals and squeeze plays make me nearly giddy. But, it’s hard to play small-ball all the time… especially if the other team scores first. The lineup boasts enough fire power to breakout those extra-base hits and home run balls now and again. I’d like to see that power a bit more consistently in 2014. Seems like 2013 produced more heroes of the “unsung” variety than the expected kind. Rookie after rookie stole the show, if only for a brief moment before another one snatched the spotlight. That may be my favorite memory of last season, so I’m anxious to see who steps up and surprises us this year. It’s hard to imagine being more impressed with “the kid” than I was last year, unless he is able to produce time and time again like he did down the stretch. That would do it. I’m curious to see how he learns from his disappointment in Game 6 in Boston and how he channels his competitive energy into controlled excellence, a la his predecessors Chris Carpenter and Adam Wainwright. The Reds will be hungry. The Pirates will feel unsatisfied. The Cardinals will have their work cut out for them. But, it feels great to know your team has as good a chance as any to bring home another division title. Mike Matheny’s squads have taken one more step each of the two years he’s been at the helm. Year one, the NLCS. Year two, the World Series. So … year three = a ring, right? There you have it. That’s my wish list. What do you want to see in 2014? 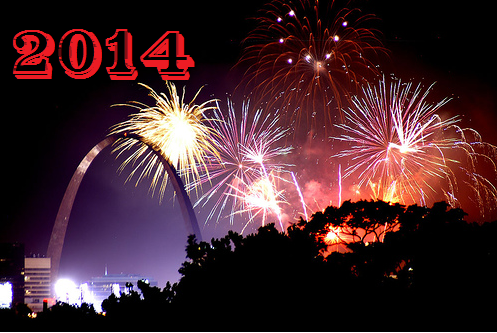 Happy New Year, from all of us here at AMF! Tara is a St. Louis Cardinals reporter for Aaron Miles’ Fastball. Follow her on twitter @tarawellman, and Follow AMF on Facebook! This entry was posted in 2014 Cardinals, MLB and tagged 2014, Adam Wainwright, Allen Craig, Ballpark Village, Busch stadim, Cardinals, Carlos Martinez, Chris Carpenter, happy new year, Jaime Garcia, Joe Kelly, Joe Kelly dancing, Lance Lynn, Matt Carpenter, Michael Wacha, Mike Matheny, NLCS, Oscar Taveras, St. Louis, World Series, Yadier Molina by Tara Wellman. Bookmark the permalink.